Finally a blog of my own. After years of rambling on Yahoo groups and Usenet discussion boards, a blog was a natural step to move on. I was fascinated to internet in the year 1999 when it all started. I was working at Ahmedabad in a cellphone company called Cellforce which later became Hutch and now Vodafone. We were given a demo on this new technology. I was instantly hooked to it. Those days there were very few internet cafe’s and they used to charge 80/- bucks an hour! I started with making a hotmail id. This accomplished, the problem was with whom to communicate? as no one had a email address then. I contacted my batch mates in the States and thus my internet life started. By then I had internet at my desk and on September 9, 2000 started a Yahoo group – Shimlahangout which later became the largest Himachal group and had basically ramblings from homesick Shimlaites and Himachalis. In the year 2000 earthquake happened in Gujarat and in 2002 the riots. Internet became a great medium to dispense actual information. It was a war during riots on the net and became very difficult to be objective. I tried my hand on reporting on the Group and analyze reasons for the mess and people responded to my posts. 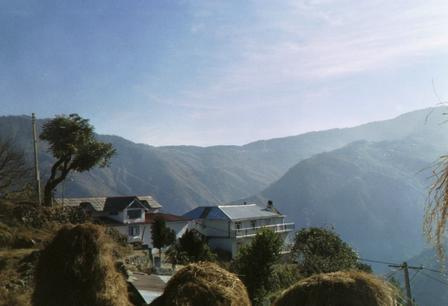 By this time another good site had come up – [i]shimla.com promoted by Ankush, a Shimlaite and a student in Australia. This was a great place to post creative ideas and the association went on till 2005 end when the site finally closed down. I contributed a large number of articles on this site but sadly did’nt saved any copies and so many articles were lost! Ahmedabad was a laid back place before the riots. It had all the small town attributes with all the facilities of a metro and a booming trade and business. I spent close to 7 years there but after riots everything changed. Gujarati Hindus and Muslims distanced themselves apart and social thread had broken. It was time to move on and with a heavy heart I bade adieu to Ahmedabad in the year 2003 and settled back in Shimla hills looking after the apple farm. Life here has been a bliss and work interesting. I got married to Anu in December 2003 and in the year 2007 was blessed with a daughter on Lohri. Life has come a full circle and I manage my life shuffling between my farm and Shimla. That picture is where I live in Shimla Hills. One Response to "Graduated to a blog"
Nice to read about you and how u look at LIFE. I am also trying to educate people on SAFE DRIVING..though i have just started to use the net for this MISSION of mine..i have MILES to go..